Bringing together the essential elements of a greatshower. Luxurious, tailor-made showering from a singleproduct. With a GROHE Rainshower® shower system, that’sexactly what you get. Rainshower® systems bring together the essential elementsof a great shower, plus a host of other benefits to enhanceyour comfort and pleasure. 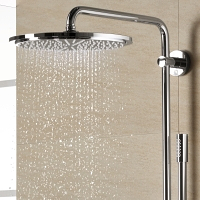 With a full metal Rainshower®head shower – from 210 mm to 400 mm diameter as well asRainshower® Allure and Veris head showers – you will enjoythe luxurious wide GROHE PureRain Spray. You‘ll also getDropStop technology to prevent after-dripping when closingthe valve. All of our Rainshower® thermostatic systems feature aGROHE CoolTouch® thermostat with a GROHE TurboStat®cartridge – designed with the world’s most sensitivethermometer in mind: your skin. The 450 mm shower armswivels, while GROHE CoolTouch® prevents scalding andprotects the GROHE StarLight® chrome surface. Go for the Best – the ultimate in luxury, style and functionmaximises enjoyment while ensuring comfort and safety. 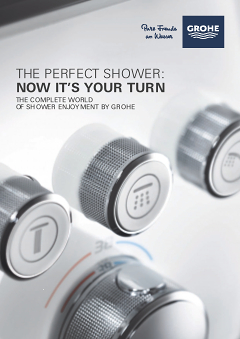 For maximum showering comfort and enjoyment choose a GROHE Rainshower® system. Our wide choice of feature-packed designs ensures there’s a system to suit all personal showering habits, style preferences and installation scenarios. For the ultimate experience, Rainshower® systems with adjustable body jets deliver tailor-made showering for all family members – whatever their height.